Most online marketing professionals and small business need to produce metrics after metrics. They need to be produced by a marketing team for a VP or by a small business owner for his or her own results. We are all being taught that key performance indicator metrics are a must. Why? Can you think of any others? YES! So, we are applying all of this work and the resulting challenge for many is understanding how well we are doing each. How do we better understand resulting key performance indicators or KPIs so we know if we are getting traction and do things the right way? It is so critical to have the right strategy and use the right KPIs. Just look at all of the available reports and raw data available through Google Analytics. Maybe you fall into the category of many of my own clients and that is that all of this data can make your head spin. How do you know where to focus your attention? How do you know which reports will help you the most? Which KPIs will provide the information that will help dictate the right modifications? Let us help you right here. 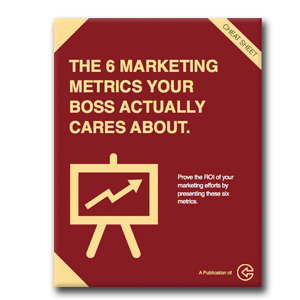 We have developed a fantastic eBook that isolates and defines the 6 most important key performance indicator metrics. This eBook is provided to you at zero cost and can be downloaded on our website. You can use the link just above or the image to the left. This eBook will shed light on many of the questions you have about analyzing the marketing work you or your marketing team applies to your website. One of the main reasons why we developed this guide to managing your key performance indicators is that 73% of executives really don't believe that marketers are focused enough on results that truly drive incremental customer demand. To that point, how can this actually be accomplished without having the ability to produce and read the related KPIs? CAC - customer acquisition cost. How do you determine the total average cost your company spends to acquire a new customer? The Marketing % Of CAC - What is the portion of your total CAC, calculated as a percentage of the overall CAC? LTV:CAC - What is the ratio of the lifetime value of a customer in relation to your CAC? Time to payback CAC - What are the number of months it takes for your organization to earn back the CAC that was spent? Marketing originated customer % - This is the ration that shows you what new business is driven by marketing, by determining what portion of your total customer acquisitions directly originated from which of your marketing efforts. Marketing influenced customer % - This key performance indicator metric takes into account all of your new customers that your marketing has interacted with while they were leads at anytime during your sales process. Some of these key performance indicator metrics may be new to you and perhaps appear a bit complex but you have many ways to go about securing them and benefiting from their application. Virtual Support Systems is committed to making this entire inbound marketing process, including these key performance indicators, work for your business. We have many other no cost eBooks that explain all inbound marketing components step by step in a guide format. Feel welcome to visit each of our web pages that are home to these many valuable eBooks. Also remember that one solution is to reach out to one of our certified inbound marketing professionals to discuss possible solutions for your business marketing objectives. We encourage you to continue your marketing research and better understand how to apply all of the developing technology to help you reach your goals.